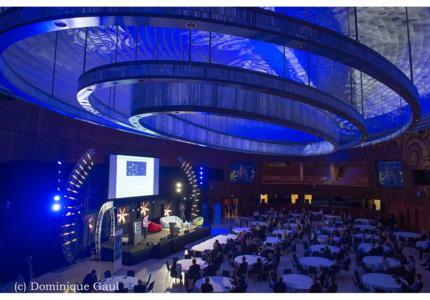 On May 9th and 10th, more than 5,000 of professionals gathered at the European Convention Center Luxembourg to discuss the latest digital, space and tech trends, and notably emerging IT trends & technologies, cybersecurity, but also the rise of machines, with experts from all over the world sharing their knowledge and vision. The first morning of the Tech Summit started with Master of Ceremony Michaël Deheneffe, Innovation & Strategy Director, Business & Decision, stating: "Until recently, the company was in silos, we were in the area of planning. But today, digital practices blow up silos and data volumes. We are entering the era of responsiveness and agility". As a matter of fact, mainstream digital culture enters the company and modifies it operations. "The data is everywhere, rich, but often trivial, incomplete or false. It can overwhelm the company if its flow is not properly processed. Data is at the heart of the company…but we must make it intelligible" he concluded. Henri Isaac, Vice President of Digital Transformation, Paris-Dauphine University, then took the stage for a presentation entitled "Should university turn into a digital platform not to become obsolete?". Mr. Isaac focused on the brand experience value chain, and described several new learning experiences, and ended his presentation by giving the audience the keys to redesigning the higher Ed value chain in the digital era, by offering on campus "maker" pedagogy, packaged services offers, by focusing on b2b relations and by promoting transdisciplinary and meta-skills. Sabri Skhiri, R&D Director, Eura Nova, then shared his Data Architecture Vision. "The three usual drivers of digital transformation are the need to reduce cost, make new revenues and sell better. The common resource here is the data" added Mr. Skhiri. Yet, companies face many challenges: how can I integrate my proof of concept with my IT systems? How do I organize my data? How to conciliate BI and analytics? He concluded: "Depending on your business, constraints and market, you need a customized data architecture, which must also be future proof". Philippe Henaux from the City of Metz and Emilie Pawlak from Nancy then presented the activities and advantages of LORnTECH, notably the number of young talents studying in the Lorraine region, the variety of training and education programs concerning digital, more than 100 private and public research laboratories, etc. "Our objective is to stimulate the emergence of projects and an entrepreneurial culture, but also help startups grow faster" added the LORnTECH experts. "Opportunity of investments in innovative startups" was the name of the speech given by Galina Degtyareva, Senior Analyst, Maxfield Capital. "We are using flexible revolving principles in choosing investment opportunities: initial topics are being validated first and those rejected are constantly replaced with new ones" explained Galina who then analyzed several portfolio cases: Parallels, Jelastic and NFWare. Dr Jorge Sanz, Professor at the LIST – Luxembourg Institute of Science and Technology – focused on the next challenges for Business Analytics in enterprises. "There are several knowledge areas building the BA domain: business competence, organization processes, modeling and technology..." added Dr. Sanz who then gave the key to reach an honorable – and generous – reconciliation between BA analytics experts and Data Science experts. Todd Hildebrant, Senior Manager, PwC Luxembourg, then listed emerging IT Trends and Technologies and shared good practices on how to prepare infrastructure for these trends: "PwC has identified five megatrends that we believe are re-shaping the global economic and commercial landscape: demographic and social change, shift in global economic power, rapid urbanization, climate change and resource scarcity and finally, technological breakthroughs". The morning conference ended with a startups insights session with Su Min Lee presenting the young company Delivery Services. Michael Hofmann, CEO, KPMG Services, acted as master of ceremony for the cybersecurity session and listed key security trends: external threats, change in the way business is conducted, rapid technology change, regulatory compliance and changing market and client need. Jornt van de Wiel, Security Researcher, Global Research & Analysis Team, Kaspersky Lab, gave a presentation entitled "How to rob banks digitally using nothing but a PC (and sometimes a drill)" and guided the audience through history from 1994 to 2017 with infamous stories such as the Skimmer ATM hack in 2008 or Barnaby Jack's presentation at the Back Hat conference in 2010 where he exploited two ATMs on stage. His presentation was followed by a speech delivered by André Loesekrug-Pietri, Founder & Managing Partner, ACAPITAL & HESTIA European Security Technologies Innovation Fund, who shared some myths and realities with the audience, focusing on cyber, AI and critical Technologies. Jérôme Totel, Vice President Product & Sales Engineering, DATA4 GROUP, and Bertrand Le Saulnier, Sales Director, InterCloud, then presented the advantages of Digital Hub, which is a secured Hybrid IT environment. "We need to adapt to our world which is changing due to data explosion, an increasing number of cyber threats, the need for fast and secure access to data, and also new regulations" added the experts. "More than 25% of CIOs plan to invest in Hybrid IT, composed of private data center platforms as multiple cloud solutions". Martin Overton, EMEA Cyber Risk Specialist, AIG, shared first response examples, statistics and lessons with the participants of the Tech Summit. " Since introducing cyber liability insurance in 1999, we have helped thousands of companies and more than twenty million individuals respond to a cyberattack" highlighted Mr. Overton. In order to prevent themselves from cyber threats, insurance companies are working with customers to help them improve their security maturity via partner services, consultancy and learning from others' mistakes and failure. He concluded: "Know your crown jewels – identify and locate critical information assets and trade secrets". A round table entitled "cyberattacks & hackers landscape" moderated by Michael Hoffmann brought together Eric Chassard (Head of Security Red Team, POST Luxembourg), André Loesekrug-Pietri, Martin Overton and François Thill (Assistant Director Communications, Ministry of the Economy and Foreign Trade Luxembourg). The latter then gave a presentation on the upcoming Cybersecurity Competence Centre which will soon be created in Luxembourg and which he described as a partnership approach for Threat Intel, Training and Testing. "The main challenges we are facing right now are fast moving targets, a lack of skilled people, a need of intense collaboration and a regulatory framework which will increase in complexity. Cybersecurity needs a transversal and cross-sectorial approach. It as a collective challenge" underlined François Thill. Master of Ceremony Sebastien Wiertz, ?General Manager, Paul Wurth InCub, opened the second day of conference by exploring the industrial cyberspace. He notably focused on information overload and added: "the 4th engineering revolution is here! Create, use and control artificial power. Every industry is concerned. AI and engineers need to merge, team up. We have to integrate new technologies into old ones, and train our employees again". Then, Benjamin Godreuil, Head of the program “Usine du Futur”, SNCF, showed the audience how the rail industry faces new technological challenges in the digital era. "We need to build, step by step, the digital twin of the factory to improve efficiency. It improves the experience of everybody in the factory and refines raw data into useful information" explained Mr. Godreuil. "A vibrant Ecosystem for Industry 4.0" was the name of the speech delivered by Robert Plana, Director Innovation and Ecosystem, ?GE Digital. "What are the key benefits of a digital industry? We maximize performance and asset availability, we increase system efficiency across operations, and optimize the lifecycle of design, manufacturing, service and repair cycles" added Robert Plana. Dr. Michael Benedikt, Head of the Future Circular Collider study, CERN, gave a presentation on the challenges and perspectives of designing a future circular collider. He then shared several examples of domains covered by FCC: tunnel infrastructures, technologies pushed in dedicated R&D programs, overall costs models, etc. "Research is for all of us, not just large companies. Disruption affects all of us – large, smaller and very small companies, especially if you are in software" started Nicolas Buck, President, FEDIL, whose presentation focused on industry and research, and future growth opportunities. Mr. Buck then shared several study cases with the audience: Circuit Foild & LIST who collaborated on enhancing copper resistance to lightning, SnT & Seqvioa who built together the robo-compliance engine for the mutual fund industry, etc. Julien Weber, Head of Sales & Business Development, WIZATA, then explained to audience how the manufacturing industry should leverage Data Science & AI to optimize complex business processes and achieve valuable ROI. His key take-aways? Start with a measurable business topic, and think big, but start small. The morning ended with a presentation named "Two sides to Great AI, Human and Technology considerations" given by Gary Richardson, Head of Data Engineering, KPMG UK. He first focused on the human side, with the necessity to build a team, invest for scale, track benefits, collect data, and develop leadership. On the other hand, the machine side should be composed of scaling automation, model portability, microservices, streaming and the 4th UI. The afternoon session started with Raja Chatila, Research Director, CNRS, ISIR – Institute of Intelligent Systems and Robotics, focusing on robotics for the Factory of the Future. He listed the 4 steps of Industry 4.0: mechanization, water power, steam power / mass production, assembly line, electricity / computer and automation / cyber physical systems. He concluded: "Factories of the future needs are difficult to achieve with fixed, manufacturing plants, and could be better addressed by a combination of qualitied human labor and new robotics technologies. We therefore need smart human-machine collaborative systems". Thomas Musiolik, Chief Technology Officer, Accenture Luxembourg, shared his company's technology vision. He first explained with AI is the new UI, described the ecosystem power plays, workforce marketplace, design for humans, and the uncharted. "We have entered the ear of the intelligent enterprise" concluded Thomas Musiolik. The Editorial director of Forbes France, Jean Rognetta, notably underlined the opportunities of AI in the world of finance, naming AI as a solution when it comes to advisory, predictions and automation. For instance, he used the example of chatbots answering the clients' questions. Alexander Ebinger, Industry 4.0 Accelerator at KUKA AG, then gave a presentation entitled "Building The Manufacturing Ecosystem – THE KUKA Industrie 4.0 Platform". He started by listing megratrends such as "the power of exponent", "changing customer expectations" and the need to think "ecosystem instead of egosystem". "AI won't be an industry. It will be part of every industry" started Jaap Zuiderveld, VP EMEAI, NVIDIA, who focused on the Intelligent Industrial Revolution. According to him, Deep learning has brought about the ‘big bang’ of AI, transforming this technology from science fiction to reality. He concluded: "GPU deep learning is changing the way software is developed and how it runs". Paul Schockmel, Vice-President Strategy, Business Development and Marketing, IEE, gave a presentation entitled "Driving the New Auto Industry Paradigm" and stated: "Disruptive technology-driven trends, such as electrification, connectivity, autonomous driving and diverse mobility, are radically changing the mobility industry". Finally, Julien Kopp, Senior Manager Risk Advisory, Deloitte, ended the Tech Summit by focusing on Robotic Process automation, or RPA: "It is a software solution executing a business process by following a pre-programmed sequence of events and integrating pre-defined business rules". He then listed the different possibilities offered by RPA: collect and validate information, save and transpose information and data, orchestrate and manage robots and employees activities…and much more.